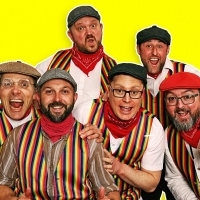 Lancashire-based comedy/ folk quartet, featuring Bernard Thresher - vocals/ guitar, Dickie Ticker - accordion/ hand percussion, Kenny Body - drums, Billy McCartney - keyboards and Bob Wriggles - bass. Original drummer Willie Eckerslike (Tom McGrath) died in May 2010. Releases include the singles "He's Turned Emo" and "Chippy Tea". They released their debut album, "Never Mind The Hotpots" in 2007, followed by: "Pot Sounds" (2008), "The Lancashire Hotpots' Christmas Cracker" (2009), "Criminal Record" (2010), "Achtung Gravy" (2011), "A Hard Day's Pint" (2012), "Crust for Life" (2013), "Golden Crates" (2014), "A Fistful of Scratchcards" (2015), "Now't like the 80's" (2016) and 2018's: "Sing-A-Longa Knees Up Jamboree".